Warsteiner Tap Takeover at Lilly's Craft and Kitchen - Oak Beverages Inc.
Warsteiner Tap Takeover at Lilly’s Craft and Kitchen, Wednesday, April 17th, 4pm-6pm. 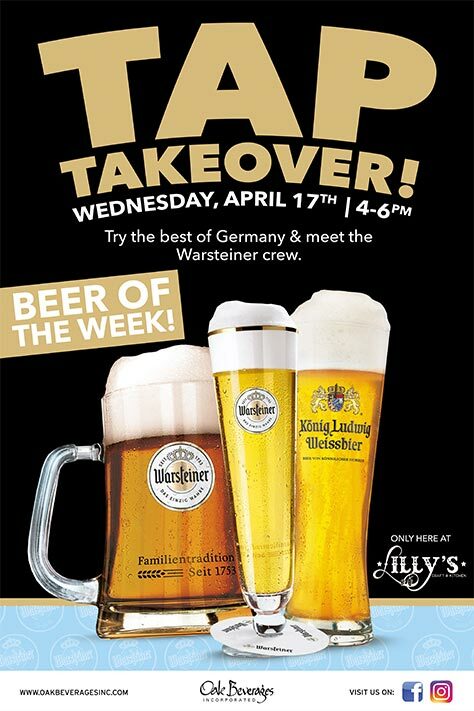 Try the best of Germany at Lilly’s Warsteiner Tap Takeover and meet the Warsteiner Crew. The right beverage for every taste. In the beginning was a pilsener, the now famous and popular Warsteiner Premium Verum. This pilsener, brewed with top-quality ingredients and the particularly soft water from Warsteiner’s own natural spring water from Arnsberg forest. In more than 60 countries worldwide, beer lovers enjoy the premium beers from Warsteiner—but no matter where it’s opened or tapped, you always get the original Warsteiner premium quality. Lilly’s Craft and Kitchen is fine dining with a warm welcome. Drink, dine and relax at the bar. Enjoy our wide selection rotating draft beers and new American cuisine. Charming tavern with exposed brick walls, serving elevated comfort eats & signature cocktails.